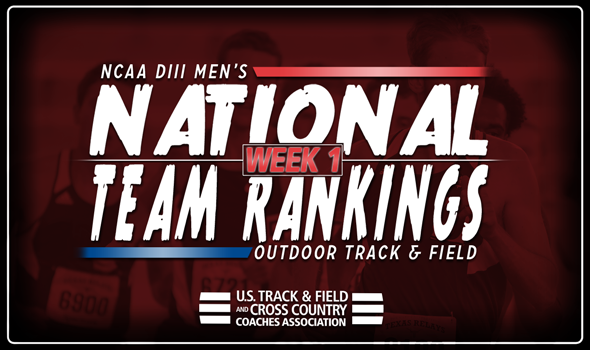 NEW ORLEANS – There was a good bit of change in the most recent NCAA Division III Men’s Outdoor Track & Field National Team Rankings that were released Tuesday by the U.S. Track & Field and Cross Country Coaches Association (USTFCCCA). Only three of the top-25 teams remained in place from the previous week, including No. 1 North Central (Ill.), No. 2 Rowan and No. 4 Augustana (Ill.). The Cardinals actually extended their lead in the rankings to 38.40 points thanks to the efforts of their distance runners this past weekend. Athletes from North Central (Ill.) packed the 10,000 at the Wash U Invitational and they notched the fourth-, fifth-, sixth-, seventh- and eighth-best marks according to the USTFCCCA Individual Rankings – which are used until there is enough data culled from the current season. The Profs added a few points to their ledger behind their 4×400 relay and Jeffrey Jon Tucker. The former reeled off the top time in NCAA DIII this season (3:17.43), while Tucker moved up to seventh in the Individual Rankings of the high jump with his clearance of 2.10m (6-10¾). George Fox shook up the top-5 as it vaulted nine spots to a program-record third following two strong weekends. The Bruins four top-6 marks in the Individual Rankings, including the No. 1 4×100 relay (41.38), the second-ranked discus thrower (Caleb Dalzell), the third-ranked decathlete (Alex Canchola) and the sixth-ranked 4×400 relay (3:18.97). The Vikings strengthened their hold on the No. 4 spot this past weekend. Ethan Ehlers moved up to No. 2 in the Individual Rankings of the shot put, Cody Wheeler is ranked No. 3 in the hammer throw and the 4×400 relay recorded the third-best time in the nation. St. John Fisher added a top-5 mark to its ledger and soared five spots from No. 10 to a program-best No. 5. The Cardinals saw Kyle Rollins clear 2.12m (6-11½) in the high jump and move into fifth place in the Individual Rankings in that event. Elsewhere in the rankings, Texas Lutheran went from No. 24 to a program-best No. 13, UMass Dartmouth climbed from No. 55 to a program-best No. 16, Christopher Newport from No. 26 to No. 17 and Williams from No. 21 to No. 19. The 2018 NCAA Division III Outdoor Track & Field Championships will be held May 24-26 in La Crosse, Wisconsin on the campus of UW-La Crosse.